It wasn’t your typical scene. Standing in the hallway of Temple High School, watching Dr. Robert Goldstein holding a small bouquet of red and white flowers in his hands, getting ready to surprise a teenager he had never met. The excitement on his face, he kind of looked like a little boy at a surprise birthday party. Then again, Dr. Robert Goldstein isn’t your typical doctor. He’s a 28 year transplant surgeon with a recognizable ponytail that stretches half-way down his back and a heart of gold. You may have seen the story by now, since it first aired on WFAA-TV, the story has gone viral, being picked up by two-dozen media outlets across the country and internationally too. Back in September, Dr. Goldstein received a letter in the mail. It was from 14 year old Ashli Taylor, a freshman at Temple High School in Central Texas. “You probably have no idea who I am,” the letter started, “but you had a great impact on my life,” it read. One of her teachers encouraged her to reach out to her doctors after learning she had a living liver transplant when she was only a few months old. Taylor was born with a congenital birth defect that caused cirrhosis of the liver. 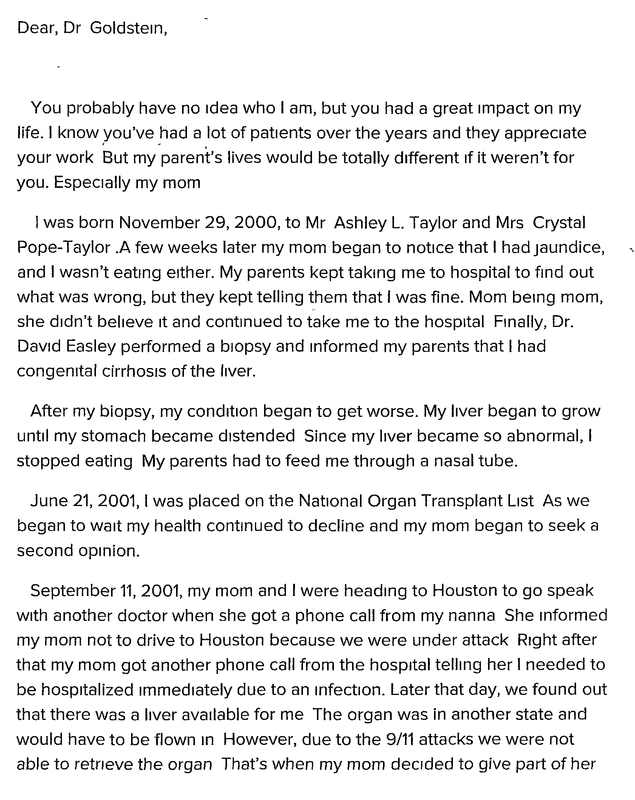 Taylor’s mother Crystal was her donor. Dr. Goldstein performed the surgery on her mother, removing the portion of the liver that would then be transplanted in Ashli. “I wanted him to know how much he has changed my life, changed my family’s lives,” Taylor said. The page and a half letter detailed her journey of where she had been, and how far she has come. Taylor who turned 15 on Sunday, is a 9th grader at Temple High School. She takes all AP courses, is a member of the band, choir and active in theatre arts. What Taylor couldn’t have imagined was the impact her words would have. “It was very touching,” said Goldstein. “This is why we get up every morning, put in the hours and do what we do,” he added. Goldstein says the letter made such an impact that he wanted to do something about it. But a phone call, or letter back wouldn’t do. Which brings me back to standing in a hallway at Temple High School. A sense of pride ran through my body as I watched Dr. Goldstein walk into the room and address Ashli. 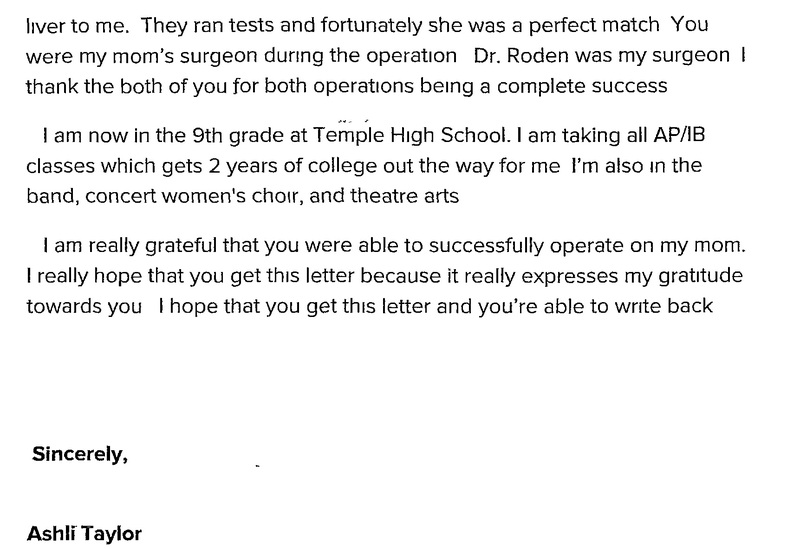 “Hi, Ashli, I’m doctor Goldstein, I’m your mom’s surgeon, you wrote me a letter,” he said. Ashli sat there in disbelief staring, trying to absorb what was happening in front of her. The shock of it all caused the 15 year old to drop her cell phone on the floor—not an easy task to separate a teenager from her phone. Then they hugged, right there in the middle of the classroom, two strangers linked together by a life-saving operation. “I wanted her to know how much her letter touched me,” Goldstein said. “I wanted her to know the impact her words had, the impact these student’s words and actions can have,” he said. It’s probably fitting that this reunion of sorts happened inside a school. Because everyone walked away that day learning an important lesson about life. Previous Previous post: Did you know you can improve brain health through your diet?